Jonathan Strassfeld has generated some data on philosophers at eleven elite U.S. PhD programs from 1930-1979 (Berkeley, Chicago, Columbia, Cornell, Harvard, Michigan, Pennsylvania, Princeton, Stanford, UCLA, and Yale [note 1]). Carolyn Dicey Jennings made some corrections and did a gender analysis, finding substantial correlations between the percentage of women in those departments in 1930-1979 and the percentage of women and non-White doctorate recipients from those same departments from 2004-2014. * The 1930, 1935, 1940, and 1945 snapshots contain exactly zero women faculty (compared to 63-71 men during the period). * The 1950 and 1955 snapshots contain exactly one woman: Elizabeth Flower at Penn (the universities have 98 and 104 recorded men faculty in those years). * In 1960, Flower is joined in the dataset by Mary Mothersill at Chicago. The 1965 and 1970 snapshots both show five women (3%) among 156 and 191 total faculty respectively. 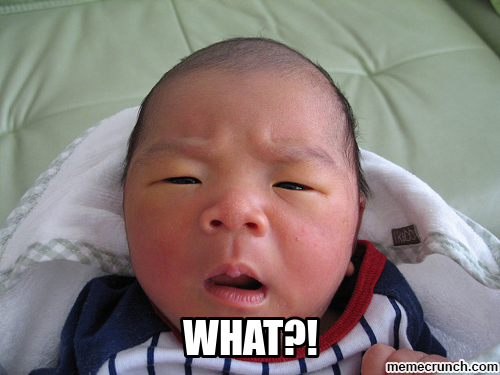 * In the late 1970s there's a sudden jump to 16/174 (10%) in 1975 and 18/171 (12%) in 1979. Thus, despite the presence of some highly influential women philosophers in the early to mid 20th century -- for example, Simone de Beauvoir, G.E.M. 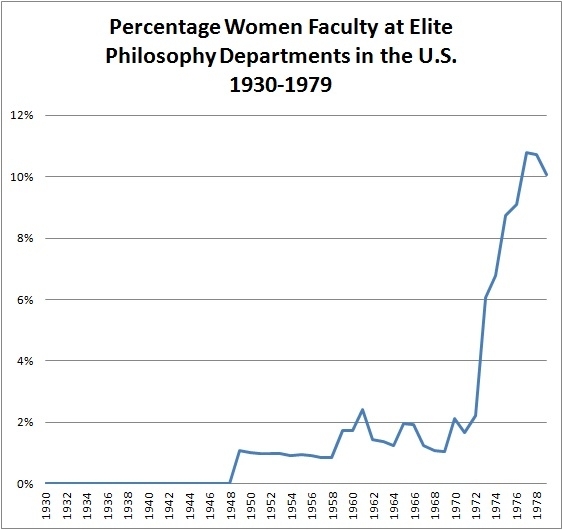 Anscombe, and Hannah Arendt -- women held a vanishingly tiny proportion of philosophy faculty positions at elite U.S. universities from the 1930s through the early 1960s, even fewer than one might be inclined to think, in retrospect, upon casual consideration. * Using data from the National Center for Education Statistics, I estimated 9% women faculty among full time four-year university faculty in the U.S. in 1988 and 12-20% in the 1990s. 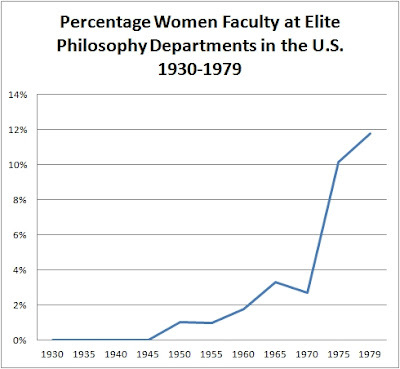 * Jennings and I found about 25% women faculty in PGR-rated U.S. PhD-granting departments in 2014. 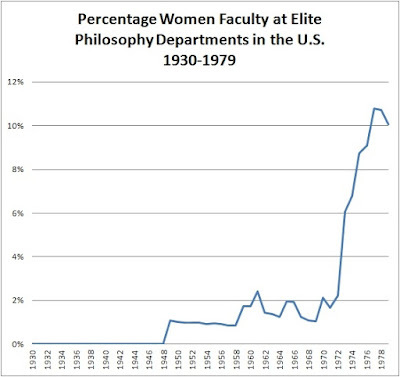 I find this a helpful reminder that, for all of the continuing gender disparity in philosophy in the 2010s, things are nonetheless much different from the 1950s. Try to imagine the gender environment that Flower and Mothersill operated in! When I arrived at Harvard in 1969, my fellow first-year graduate students and I were taken up to the roof of Widener Library by a well-known philosopher of classics. He told us how many Episcopal Churches could be seen from that vantage point. As a Jew (in fact a convert from Episcopalian Christianity), I knew that my husband and I would have been forbidden to marry in Harvard's Memorial Church, which had just refused to accept a Jewish wedding. As a woman I could not eat in the main dining room of the faculty club, even as a member's guest. Only a few years before, a woman would not have been able to use the undergraduate library. In 1972 I became the first female to hold the Junior Fellowship that relieved certain graduate students from teaching so that they could get on with their research. At that time I received a letter of congratulation from a prestigious classicist saying that it would be difficult to know what to call a female fellow, since "fellowess" was an awkward term. Perhaps the Greek language could solve the problem: since the masculine for "fellow" was hetairos, I could be called a hetaira. Hetaira, however, as I knew, is the ancient Greek word not for "fellowess" but for "courtesan." I determined which departments to survey recursively, defining the "leading departments" as those whose graduates comprised the faculties of the leading departments. Focusing on the period of 1945-1969, when universities were growing explosively, I found that there was a group of eleven philosophy departments that essentially only hired graduates from among their own ranks and foreign universities - that it was virtually impossible for graduates of any American philosophy departments outside of this group to gain faculty positions at these "leading departments." Indeed, between 1949-1960, no member of their faculty had received a Ph.D. from an American institution outside of their ranks. There were, of course, border cases. Brown, Rockefeller, MIT, and Pittsburgh in particular might have been included. However, I judged that they did not place enough graduates on the faculties of the other leading universities, particularly during the period 1945-1969, for inclusion. This list also aligns closely with contemporary reputational assessments, with ten of the eleven departments ranking in the top 11 in a 1964 poll (Allan Murray Carter, An Assessment of Quality in Graduate Education). Also, Strassfeld notes (personal communication) that the list only includes Assistant, Associate, and full Professors, not instructors or lecturers (such as Marjorie Greene who was an instructor at Chicago in the 1940s). A hypothetical from Darrell Rowbottom, in conversation: Suppose you are a perfect moral rationalizer. Suppose you know that for any action you want to do, you are clever enough a moral theorist that you could find some plausible-seeming post-hoc justification for it. Would you actually need to come up with the justification? Maybe it's enough just to know in advance that you could come up with one, and not actually do the work? Think of the savings of time and cognitive effort! Also, since self-serving rationalizations might tend to lead one away from the moral truth, you might be epistemically better off too. With or without an actual filled-in rationalization, you'll be able to feel fine about doing what you want. Call this Empty Box Rationalization. Why bother to fill the box with an actual rationalization? Simply postulate that a plausible-seeming justification could be found! Of course, few of us are clever enough moral theorists to take advantage of Empty Box Rationalization without limitation. As skilled as we may happen to be at justifying our actions to ourselves, there will be some actions beyond the pale, which we are incapable of plausibly rationalizing. However, we might be able to take advantage of Limited Empty Box Rationalization. Limited Empty Box Rationalization differs from full Empty Box Rationalization by confining itself to a range of rationalizable actions. For any action within a certain range, I know that I am clever enough a rationalizer to devise, if I want, some plausible-seeming justification which I would accept upon reflection; and thus I can postulate that such a justification is out there to be found. Here's an example. Suppose I'm always fifteen minutes late. Every time I show up late, I always manage to find a satisfactory excuse. Sometimes it's traffic. Sometimes it's that I really needed to finish some important task first. Sometimes it's that I got lost. Sometimes it's that I was detained by someone else. I always find some way to let myself off the hook, so that I never feel guilty. Now imagine that today I find myself arriving fifteen minutes late for a meeting with a graduate student. I could, hypothetically, go through the effort of trying to concoct an excuse. But maybe instead of wasting that time, I can just postulate the existence of some plausible excuse or other, so that we can get straight into the meeting without further delay. People will differ in their degree of cleverness and thus differ in their working ranges of Limited Empty Box Rationalization. Some will be clever enough reliably to justify 15 minutes of tardiness; others clever enough reliably to justify 30 minutes. Some will be clever enough to justify reneging on wider ranges of commitments, to justify wider ranges of gray-area misconduct, perhaps even to justify, to their own satisfaction, what the rest of us would judge to be plainly morally odious. For one especially skillful example, consider Heidegger on Nazism. Of course, this isn't fair. If only we were more clever we too could rationalize such actions! Perhaps for any action that I've done or that I'd really like to do, a clever enough moral theorist could, with enough work, come up with some plausible-seeming justification of it that would satisfy me. But then -- maybe that's good enough! If I know that a cleverer version of myself would believe A, then maybe that knowledge itself suffices to justify A, since who am I to disagree with a cleverer version of myself, who could of course get the better of me in argument? Advanced Empty Box Rationalization begins with that thought. Advanced Empty Box Rationalization widens the range of Limited Empty Box Rationalization beyond the boundaries of one's own actual rationalizing capacities. For some range of actions wider than one's usual range of rationalizable actions, one justifiably accepts that either one could come up with a plausible-seeming justification that one would accept upon reflection, given that one is motivated to do so, or a cleverer version of oneself could devise such a justification. Perhaps as a limiting case one could accept that an infinitely clever version of oneself could hypothetically justify anything in this manner. Application of these thoughts to current and past scandals in the profession is left as an exercise for the reader. Schwitzgebel & Ellis (forthcoming), Rationalization in Moral and Philosophical Thought. I'm highly allergic to shellfish. I'm allergic enough that cross-contamination is an issue: If I'm served something that has been fried on the same surface as shellfish or touched with an implement that has touched shellfish, I will have a minor allergic reaction. Shellfish is so prevalent in the southern coastal Chinese diet that I have minor shellfish reactions at about half of my lunch or evening meals, even if I try to be careful. I've learned that there are only two types of restaurants that are entirely safe: strict Buddhist vegetarian restaurants and McDonalds. I was discussing this with my hosts at a university here in Hong Kong. One of the hosts said, "Well, we could go to that Buddhist restaurant that we took [the famous vegetarian philosopher] Peter Singer to". Sounds like a good idea to me! Another host said, "Yes, but that restaurant is so expensive! Too bad there isn't another good Buddhist restaurant around." I suggested that McDonalds would be fine, really. I didn't want to force them to spend a lot of money hosting me. It occurred to me that they should have taken Peter Singer to McDonalds, too. Singer is as famous for his argument against luxurious spending as he is for his argument in favor of vegetarianism, and one of his favorite examples of needless luxury spending is high-priced restaurant meals. The idea is that the money you spend on a luxurious restaurant meal could be donated to charity and perhaps save the life of a child living in poverty somewhere. So here's my thought. 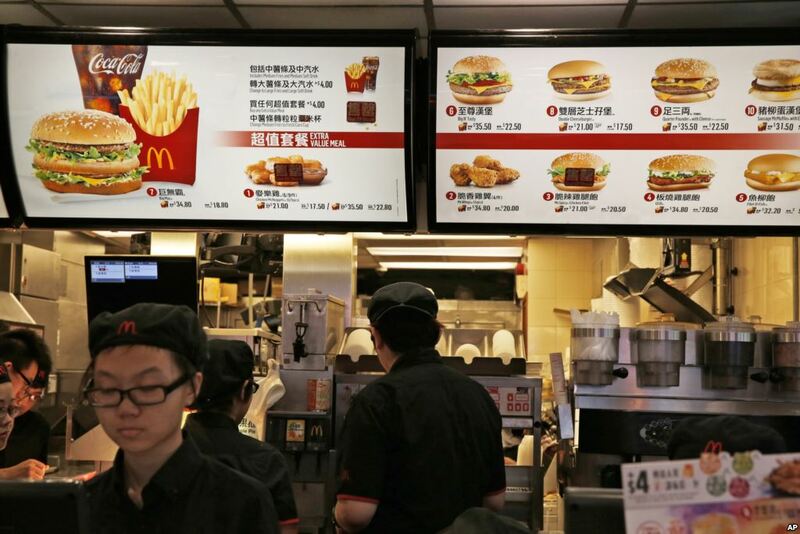 Suppose that the two options are (a) an expensive Buddhist restaurant, maybe $300 Hong Kong dollars per person for 10 people, $3000 Hong Kong dollars total ($400 US dollars), or (b) McDonalds for $500 HKD total ($65 US dollars). The money saved by choosing option b, if donated to an effective charity, is within the ballpark of what could be expected to save one person's life [update: or maybe about a tenth of a life; estimates vary]. On the other hand, the flesh from a steer can generate about 2000 McDonald's hamburgers, so ten people would be eating only 1/200 of a steer. Clearly one [or one tenth of a] human life is more valuable than 1/200 of a steer. Therefore, the university should have taken Peter Singer to McDonalds and donated the savings to an effective charity. Of course, there are other costs to McDonalds (other wasteful practices, environmental damage in meat production, etc.) and possibly other benefits to eating at the Buddhist restaurant (supporting good farming practices, possibly putting the profits to good use) -- but it seems unlikely that these differences would cumulatively outweigh the central tradeoff of the unsaved human life vs. 1/200 of a steer. Our own dinner decision resolved in favor of the cheap student vegetarian cafeteria nearby, which I think maybe they had been hesitating about because it didn't seem fancy enough a venue for a visiting speaker. But it was perfect for me -- a rather "utilitarian" place, I might say -- and probably where they really should have taken Singer. 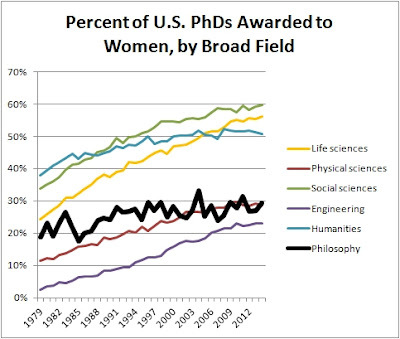 As Carolyn Dicey Jennings and I have documented, academic philosophy in the United States is highly gender skewed, with gender ratios more characteristic of engineering and the physical sciences than of the humanities and social sciences. However, unlike engineering and the physical sciences, philosophy appears to have stalled out in its progress toward gender parity. The quadratic fit (green) is statistically much better than the linear fit (red; AICc .996 vs .004), meaning that it is highly unlikely that the apparent flattening is chance variation from a linear trend. 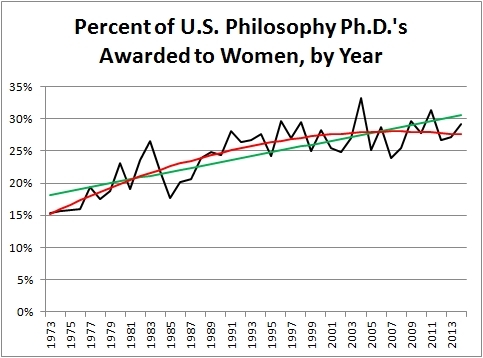 Since the 1990s, the gender ratio of U.S. PhDs in philosophy has hovered steadily around 25-30%. The overall trend is clear: Although philosophy's percentages are currently similar to the percentages in engineering and physical sciences, the trend in philosophy has flattened out in the 21st century, while engineering and the physical sciences continue to make progress toward gender parity. All the broad areas show roughly linear upward trends, except for the humanities which appears to have flattened at approximately parity. These data speak against two reactions that I have sometimes heard to Carolyn's and my work on gender disparity in philosophy. One reaction is "well, that just shows that philosophy is sociologically more like engineering and the physical sciences than we might have previously thought". Another is "although philosophy has recently stalled in its progress toward gender parity, that is true in lots of other disciplines as well". Neither claim appears to be true. Vocals: Nomy Arpaly. Guitar: David Estlund. My favorite animal is the human. My favorite planet is Earth. But it's interesting to think, once in a while, about other possible advanced psychologies. Over the course of a few related posts, I'll consider various possible architectures for superhuman group minds. Such minds regularly appear in science fiction -- e.g., Star Trek's Borg and the starships in Ann Leckie's Ancillary series -- but rarely do these fictions make the architecture entirely clear. One cool thing about group minds is that they have the potential to be spatially distributed. The Borg can send an away team in a ship. 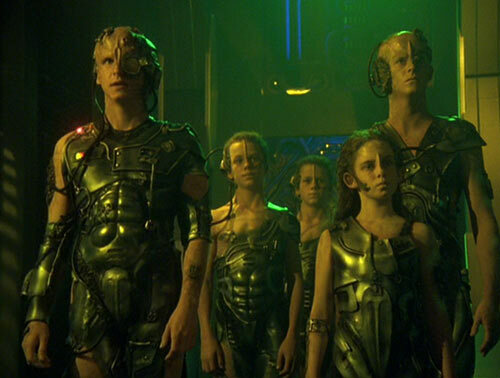 A starship can send the ancillaries of which it is partly composed down to different parts of the planet's surface. We normally think of social groups as having separate minds in separate places, which communicate with each other. But if mentality (instead or also) happens at the group level, then we should probably think of it as a case of a mind with spatially distributed sensory receptors. So how might perception work, in a group mind? If the architecture is highly centralized, it might work like this: Each humanoid aims its eyes (or other sensory organs) toward a sensory target, communicating its full bandwidth of data back up to the ship for processing by the central cognitive system (call it the "brain"). This central brain synthesizes these data as if it had two hundred pairs of eyes across the planet, using information from each pair to inform its understanding of the input from other pairs. For example if the ten humanoids in Squad B are flying in a sphere around an airplane, each viewing the airplane from a different angle, the central brain forms a fully three-dimensional percept of that airplane from all ten viewing angles at once. 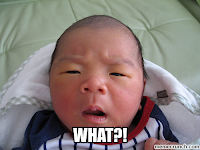 The central brain might then direct humanoid B2 to turn its eyes to the left because of some input from B3 that makes that viewpoint especially relevant -- something like how when you hear a surprising sound to your left, you spontaneously turn your eyes that direction, swiftly and naturally coordinating your senses. Two disadvantages of this architecture are the bandwidth of information flow from the peripheral humanoids to the central brain and the possible delay of response to new information, as messages are sent to the center, processed in light of the full range of information from all sources, and then sent back to the periphery. A more distributed architecture puts more of the information processing in the humanoid periphery. Each humanoid might process its sensory input as best it can, engaging in further sensory exploration (e.g., eye movements) in light of only its own local inputs, and then communicate summary results to the others. The central brain might do no processing at all but be only a relay point, bouncing all 200 streaming messages from each humanoid to the others with no modification. The ten humanoids around the airplane might then each have a single perspectival percept of the plane, with no integrated all-around percept. Obviously, a variety of compromises are possible here. Some processing might be peripheral and some might be central. Peripheral sources might send both summary information and also high-bandwidth raw information for central processing. Local sensory exploration might depend partly on information from others in the group of ten, others in other 19 groups of ten, or from the central brain. At the extreme end of central processing, you arguably have just a single large being with lots of sensory organs. At the extreme end of peripheral processing, you might not want to think about the system as a "group mind" at all. The most interesting group-mind-ish cases have both substantial peripheral processing and substantial control of the periphery either by the center or by other nodes in the periphery, with a wide variety of ways in which this might be done. I've already suggested one high integration case: having a single spherical percept of an airplane, arising from ten surrounding points of view upon it. The corresponding low integration case is ten different perspectival percepts, one for each of the viewing humanoids. In the first case, there's single coherent perceptual map that smoothly integrates all the perceptual inputs; in the second case each humanoid has its own distinct map (perhaps influenced by knowledge of the others' maps). This difference is especially interesting in cases of perceptual conflict. Consider an olfactory case: The ten humanoids in Squad B step into a meadow of uniform-looking flowers. Eight register olfactory input characteristic of roses. Two register olfactory input characteristic of daffodils. What to do? Central dictatorship: All ten send their information to the central brain. The central brain, based on all of the input, plus its background knowledge and other sorts of information, makes a decision. Maybe it decides roses. Maybe it decides daffodils. Maybe it decides that there's a mix of roses and daffodils. Maybe it decides it is uncertain, and the field is 80% likely to be roses and 20% likely to be daffodils. Whatever. It then communicates this result to each of the humanoids, who adopt it as their own local action-guiding representation of the state of the field. For example, if the central brain says "roses", the two humanoids registering daffodil-like input nonetheless represent the field as roses, with no more ambivalence about it than any of the other humanoids. Winner-take-all vote: There need be no central dictatorship. Eight humanoids might vote roses versus two voting daffodils. Roses wins, and this result becomes equally the representation of all. Compromise vote: Eight versus two. The resulting shared representation is either a mix of the two flowers, with roses dominating, or some feeling of uncertainty about whether the field is roses (probably) or instead daffodils (possible but less likely). Retention of local differences: Alternatively, each individual humanoid might retain its own locally formed opinion or representation even after receiving input from the group. A daffodil-smeller might then have a representation something like this: To me it smells like daffodils, even though I know that the group representation is roses. How this informs that humanoid's future action might vary. On a more autonomous structure, that humanoid might behave like a daffodil smeller (maybe saying, "Ah, it's daffodils, you guys! I'm picking this one to take one back to the daffodil loving Queen of Mars") or it might be more deferential to the group (maybe saying, "I know my own input suggests daffodils, but I give that input no more weight than I would give to the input of any other member of the group"). Finally, no peripheral representation at all: An extremely centralized system might involve no perceptual representations at all in the humanoids, with all behavior issuing directly from the center. There's an intuitive distinction between knowing something conceptually or abstractly and having a perceptual experience of that thing. This is especially vivid in cases of known illusion. Looking at the Muller-Lyer illusion you know (conceptually) that the two lines minus the tails are the same length, but that's not how you (perceptually) see it. The conceptual/perceptual distinction can cross-cut most of the architectural possibilities. For example, the minority daffodil smeller might perceptually experience the daffodils but conceptually know that the group judgment is roses. Alternatively, the minority daffodil smeller might conceptually know that her own input is daffodils but perceptually experience roses. If the group is literally phenomenally conscious at the group level, then there might be 201 streams of experience (one for each humanoid, plus one for the group); or there might be only one stream of experience (for the group); or streams of experience might not be cleanly individuated, with 200 semi-independent streams; or something else besides. The dictatorship, etc., options can apply to the group-level stream, as well as to the humanoid-level streams, perhaps with different results. For example, the group stream of consciousness might be determined by compromise vote (80% roses), while the humanoid streams of experience retain their local differences (some roses, some daffodils). Similar issues arise for group level memory, goal-setting, inferential reasoning, and behavior. I'll work through some of these in future posts. I also want to think about the moral status of the group and the individuals, under different architectural setups -- that is, what sorts of rights or respect or consideration we owe to the individuals vs. the group, and how that might vary depending on the set-up. Possible Psychology of a Matrioshka Brain (Oct. 9, 2014).